A new member of chambers? TopFirst, OldRuin, UpTights … Fans of BabyBarista will be familiar with the cast of reprobates, chancers and other exemplary members of the legal profession who appear in the column. Now you have the chance to exercise your imagination by creating a fictional character who will then appear in the blog. 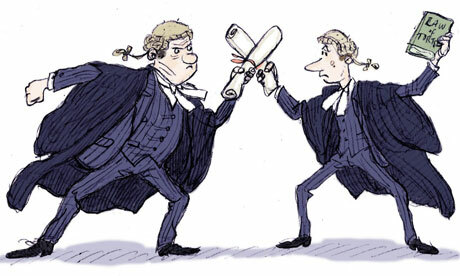 He or she might be a barrister, solicitor, clerk or some other colourful personality that hangs out in the legal world. They might be worried about the modernisation of the bar, or the Jackson reforms and their effect on their income. On the other hand, they might see great opportunities to be had in Tesco law and think the profession badly needs shaking up. Whoever they are, all you need to do is describe their personality in a paragraph in the comments section on The Guardian’s page this page here, and I will pick the winner and include them in a post. The closing date is 22 May, giving you plenty of time to master the brief. Naturally, being the sneaky lawyer I am, I’ll also keep the rights to the character – so you might end up discovering him or her in a future BabyBarista book. The winner and three runners-up will also receive a copy of Law and Peace, the second book in the BabyBarista files (Bloomsbury, £11.99).